We’re not talking about the Alamo here. I’m not referring to where the Texans kept gun powder, cannon balls and other ammo. We’re talking 25 Alston Avenue, and that small room wedged in between our kitchen and our breakfast room. I think Mom was responsible for identifying our downstairs bathroom as the powder room. I’m not sure if I ever heard Dad referring to it that way. And for sure, Mommie Soph didn’t it. Looking back at it, the term had a certain Race Brook Country Club feel to it. And clearly at Race Brook this room was reserved exclusively for women’s use. I don’t know if there was even a toilet in Race Brook’s powder room! I think of it as a place where ladies went to re-powder their noses, fix lipstick and engage in chit-chat with a friend. 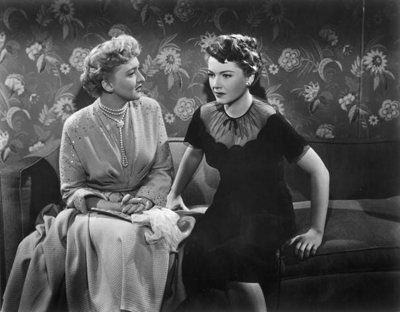 I love the scene in All About Eve when Eve Harrington (Ann Baxter) and Karen Richards (Celeste Holm) use the powder room to spar & unsheathe their claws! The powder room on our first floor was certainly open to men! True, we did have counter space & a good sized mirror to the right of the sink, and a plush stool placed so it could be put to use for a lady guest to adjust make-up and such. But there was only enough room to accommodate one person at a time! Meaning, Boopie Grant and Selma Decker would have to seek other space to engage in a private convo! Aside from the plush stool, the most distinctive feature of our powder room was the wall paper. Not some flocked floral as seen in All About Eve! 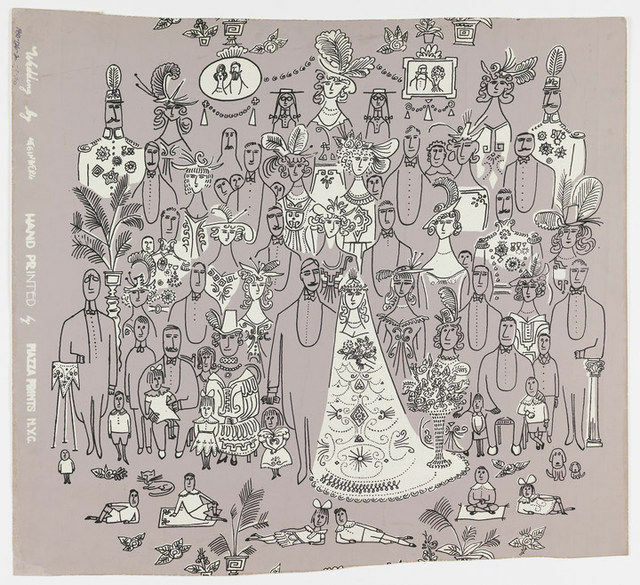 But rather an Edwardian Wedding scene drawn by The New Yorker’s famed artist: Saul Steinberg. The background was a light pink, with Steinberg’s characteristic simple line drawing spaced marvelously in a repeated pattern. I loved that print! It gave me something to look at while dropping a deuce (other than staring into the mirror)! Not everyone was a fan of that print, however. Gary Moss, for one, felt the wedding party was staring at him. And I can see where that might cause a high degree of anxiety and/or embarrassment! Mom eventually changed the wall paper to a black and gold flocked something-or-other. Maybe Dad felt the wedding party was staring at him, too? Sad. We went from New Yorker clever to neo-bordello! n.b. One other anecdote to share about another use of our powder room. One night after dinner I developed a particularly toxic case of gas… farts that could singe your nostril hairs. I decided that the powder room was the best place to do my homework. I took my books, sat on the stool and while doing my homework I proceeded to unleash an impressive string of “silent-but-deadlies”. I thought this was the best way to ensure the safety of the household. Good thought. But Dad needed to use the “gents” himself, and he opened the door to the powder room which immediately released the collected sulfur-based miasma and buckled his knees. His reading glasses may also have slipped off his nose, too – although I am not sure of this final detail.